Here's another post. Life is still the same. Only now I'm balancing writing a WWII novel with a contemporary mystery. Oh and spent a lot of time the last couple weeks trying to beat another WWII proposal into submission. Amazing how the more I write, the more the process stays the same. One of the challenges of the writing life is how to balance the need to write contracted books with the need to constantly cultivate new ideas. For example, right now (April 2011) I'm writing the contemporary romantic suspense set on Mackinac Island. 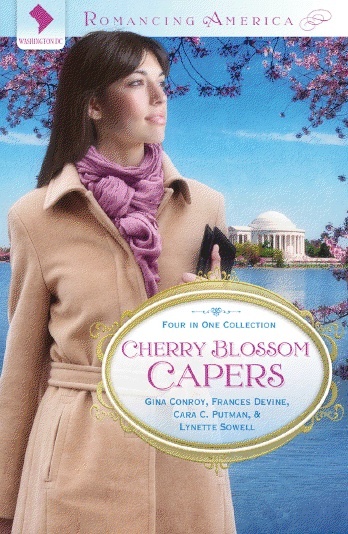 I'm also thinking about the romance and mystery novella I'm writing in the Cherry Blossom Capers. Then last week I fleshed out a possible three book world War II series. It involves three sisters who do very different things during the war and all end up in London for a piece of it. See? Very different. It's like juggling several plates...er...plots at the same time. Just when it gets overwhelming, I get fabulous feedback like this from a reader who lived a story I wrote. That keeps me going! I can't wait to get this package from my editor! So anyone want to guess which memorial/monument is in the background on this gorgeous cover? So looking forward to reading this one, Cara! Wow. That looks intriguing. I will have to look for a copy of the Cherry Blossom book. Isn't it exciting to have so many ideas swimming around and starting to come out. My sister found your Ohio Brides in her local library in Michigan. She can't wait to read it. She loved your Stars in the Night. I'm with Sabrina, looks to be the Jefferson Memorial to me. Ooh, a D.C. placed book. Love D.C., so though I don't often read contemporary romance I'm thinking I should pick this one up when it's out! Jefferson Memorial is correct. And Anne, you're doing great as a new writer. So excited to read your second book! Thanks for autographing one for me!